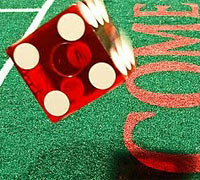 Craps can be your destiny-make game with huge jackpot won. Play it to hit huge jackpot or enjoy the game during the whole evening without worrying about great losses. The magic is hidden within online craps strategies. There are plenty of them. Choose your own way to play craps online games with the best system to win. 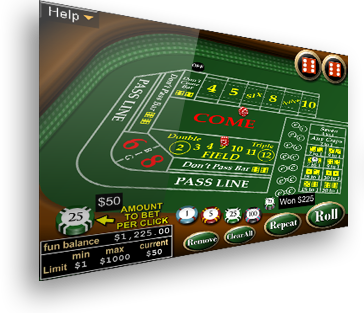 After reading this article, you will know how to win craps with the Iron Cross system. It is quite easy to play... and win. Let's find out how. Being one of the easiest craps betting systems, Iron Cross strategy requires you to make a Field bet on 5, 6 and 8. Thus, if you get 2, 3, 4, 9, 10, 11 or 12, your Field bet wins while all your other bets are stayed on the table. If you get 5, 6 or 8, you win one of the best placed while two others remain on the table. Whatever happens, you lose only if 7 is rolled. Only six of the thirty six possible dice combinations can result in a 7. In other words, your every sixth roll can be a 7, while other five rolls bring you some wins. The Iron Cross system seems to be unbeatable. But whether it is really so? So, yes or no. Well, actually, no. Such craps strategy allows you to have a great time feeling a pure excitement. However, it doesn't have a winning edge over the casino. Clearly, as any other craps system, Iron Cross strategy has a house edge. Just don't forget about it. Let's see. Only one in six of the rolls can result in a loss. However, you should note that only one of your wagers will win at a time. On the other hand, a seven appeared results in losses of all your four bets at once. You also can check the individual bets made. Bets placed on 5, 6 and 8 have the house edge that ranges from 1.52% to 5.56%. Just combine all these wagers to count the Iron Cross house edge. With four bets of the same size you will be playing with the house edge of 3.87%. Now you know that the Iron Cross system is not perfect for you if consider only mathematical point of view. Of course, you can start counting the rolls to find out when it will be a 7. Every sixth roll. Record recent rolls to predict. However, now you will act relying on one of craps myths or so called gambler's fallacy. If you think that past rolls of the dice can determine your future rolls, you are wrong. Completely. Absolutely. Every roll is unique, random and can't be influenced by anything. At all. Just remember – EVERY future roll can a 1/6 chance to present you a 7. Clearly, the Iron Cross strategy is not perfect. With the house edge of 3.87% and useless counts, this betting system seems to be not so great to win. Well, if you don't count on constant winning and ready to the risky bets, you can play with quite low house edge.